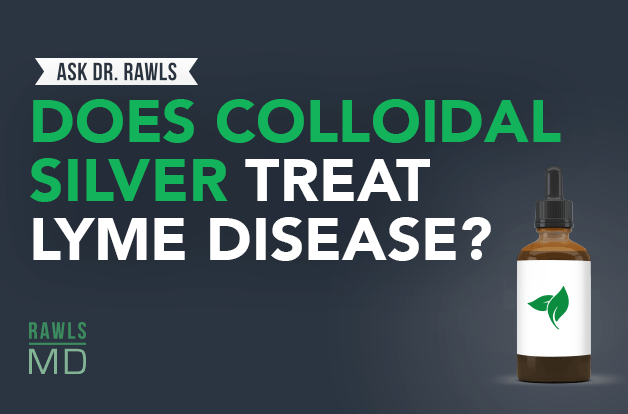 Does Colloidal Silver Treat Lyme Disease? Home/Health-Articles/Does Colloidal Silver Treat Lyme Disease? Colloidal silver has antimicrobial properties, but it’s also a toxic heavy metal. Find out if silver is a safe and effective treatment for Lyme disease. Question: Does colloidal silver treat Lyme disease? The answer is yes, colloidal silver does have antimicrobial properties. The question is, do we want to use it on humans? There’s no doubt that silver has antimicrobial properties that have been well-documented for a long time. But so does mercury. All heavy metals have some antimicrobial-type properties. We have people that are doing everything they can to get mercury and heavy metals out of their bodies, and yet they’re dumping silver into their bodies to try to kill Lyme disease bacteria. It really doesn’t make that much sense to me. Silver is not as toxic as mercury, but it still does have some toxicity, and it’s really hard for your body to remove it. If you use it for a long time, you are going to accumulate silver in your tissues. Back when I was struggling with Lyme disease, I actually tried colloidal silver. I took it for a short period of time, and compared to other things that I used — predominantly herbs — it didn’t seem to have quite the punch that the herbs did. One herb alone wasn’t enough, but when I took combinations of herbs, that seemed to be superior to the silver. So, for me, herbs were really a much better choice. I still have some reservations about silver, and I think that when you look at the spectrum of things that you can use for Lyme disease, herbs rank right up there at the top. Silver is quite a bit further down the list. When you look at overcoming Lyme disease, it’s not a week or day type of thing. You have to take the antimicrobial for months and years. It’s about long-term suppression, and the advantage of herbs is you can do that long-term suppression without toxicity to your body. If you’re looking at treating Lyme disease with silver, remember, you’re not talking about days or weeks, you’re talking about months and years of using it, which could potentially increase the toxicity. I would put my money on the herbs as being the better therapy out there.